This is just such a good tip that I have to post it annually! I am still using these same whiskey barrel planters, 3 years later. I’ve just added a bit more soil every year and some fertilizer. Garden season has officially hit upstate New York! We have to wait around here until after Memorial Day for our “last frost” date. So I planted up my cedar whiskey barrels a week or so ago. Now, those of you who have filled up planters know they can take a LOT of soil. 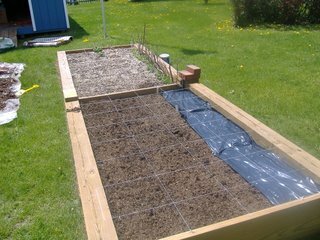 I use the square foot intensive gardening method in my raised vegetable beds to get as much produce from as little room as possible. 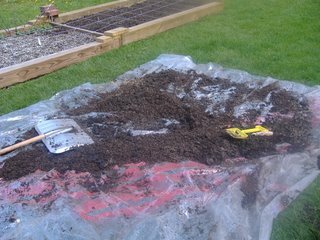 To keep it organic, and to give the plants the maximum amount of nutrients, I mix up my own soil mix based on Mel’s Soil Mix from the Square Foot Gardening website. The mix is peat moss, compost and vermiculite. While each of these items isn’t that expensive on it’s own, when you are making enough to fill a 4X8 bed and 13 or so planters, it can run into some cash. I feel that this is one of those instances where spending some money is worth it-I only have to mix up the soil once and then just amend it with some compost each year to have the perfect growing medium for my plants. Although spending the money is worth it, it does NOT make sense to just waste it. Most plants only grow in the top 6 inches of soil. So why fill a planter with 12-16 inches of soil? I did some research online, and asked my friends over at Frugal Living @ About.com, and decided that I could fill the bottom of the planters up with just about anything. 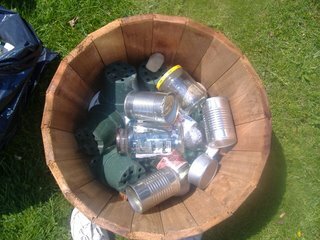 I used leftover plastic plant 6 packs, plastic margarine tubs (with the lid on), tin cans, soda bottles, glass jars with lids, 6″ plastic pots from geraniums last year and anything else I could find that would fill up space and still allow water to flow through. I pretty much emptied out my recycle bin-Reduce, Recycle, Reuse! Viola! The planters were filled with 1/2 the soil. Good for me, good for the environment, and as a bonus the planters stayed light enough for me to move them by myself! And if you are wondering, I used the planter to plant winter squash, summer squash, melons and pole beans in. The summer squash and pole beans are placed to the side of the deck and there will be strings run from the planters up to the posts on the deck, and the winter squash and melons are on double stacked planters so they have some room to grow down. Just for fun, here is a “before” picture of the Sq Ft garden a few days before Memorial Day. I’ll take some “after” shots once the rain stops of all my veggies. « Our Fairly Frugal Wedding, Revisited. Oh this is a fantastic idea, why haven’t I read this post before, must have a look at some of your older stuff. Our Council is just about to change our collections to fortnighly instead of weekly and for some reason known only to them we can’t put glass of any description in the recycling bin and only very specific kinds of plastic which I do understand not all of it can be recycled. But this willl save us at least one trip to the recycling yard a month to drop off the glass and anything to cut back on petrol use is appreciated at the minute. I’m lucky in that I don’t have to drive much. We don’t have huge loss leaders in Ireland which would more than likely be on the outskirts of town if we did so our local shops still tend to be a lot cheaper and fresher that anything Tesco or Asda can offer. We do have Lidl which is the same as Aldi but you don’t have to regster but I’m still lucky enouogh to have one in walking distance. Keep up all the great posts, you’re saving me a small fortune. The tip about filling up the planters with other material before using soil is one of the best, i have included it on my own frugal site and often falg it up as a great money saving gardeing tip. Leanne-Glad this will work for you. It was sort of one of those things where I smacked myself on the forehead and said “duh-I should have figured that out sooner”. And the great thing is not only does it not cost you anything, it actually makes filling the planters easier and cheaper! Kate-it really is a great tip. I must have missed this tip the first time- I am so glad you posted this. Very smart! I love that idea! And it’s also practical because the barrel won’t be so heavy (not that you probably have to move it, but you never know). Oh, and I really like your wallpaper. I guess I just haven’t noticed it because I usually read through a reader. And I definitely like the idea of re-posting your best posts and am trying to do that more myself. Amy, Jan & Rebecca-I hope it works as well for you as it does for me! Rebecca-thanks, I wasn’t sure if the flowers were too “girly”. I have a nice money one I might try later. As I said before Gardening is one of my hobby. Now that Spring is here it’s time to do something with my Outdoor garden Planters. Planters are great in your backyard or frontyard. Even during wintertime you still can enjoy the smell of your flowers using some Indoor Planters and Window Box Planter. You can put Decorative Planter practically anywhere around your house. They look really nice when they are filled up with those beautiful flowers. Anyway Garden Planters can be very expensive sometimes especially if it’s decorative one. But you can visit the Planter Ixchange dot com. You will be surprise how affordable their products are. They have a lot of collections from High End Planters. Looking for wrought iron, metal, copper, clay? They have it all from different colors and shapes. This is a great idea! 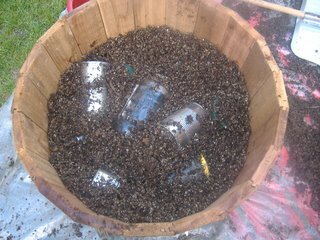 With all the talk about plastics leaching, though, is it safe for the food that grows in these barrels? I guess you could check the number on the bottom of the container to see if it’s one of the “safe” plastics or not. On Earth Day, here in Canada, we are aloud to go to our municipality for free compost soil. I did just that and filled all of my planters. Do I add fertilizer to this, or is it good to go?